We are affiliated with the National Association of Home Builders, the Texas Association of Builders, and the Arkansas Builders Association. The state of Texas does not require residential contractors to be licensed. This means that you, as a homeowner, need to make certain that you hire a professional and not a part-timer. A professional will have a history that includes completed projects and testimonials from customers. A professional will be able to show evidence of General Liability Insurance. A professional will provide a detailed estimate for the work to be done. 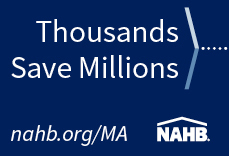 If you are building a new home, a professional will provide a homeowner's warranty. Few life decisions have the impact of purchasing or building a new home. Take the time to get a "Professional". Choose a member of the HBA of Texarkana!